Our next stop was Uluru, the giant red rock practically in the center of the continent. I think many of us, myself included, forget how large the continent of Australia is and misjudge the distance between cities. For comparison purposes, the distance between Sydney and the Ayers Rock airports is almost exactly the same distance as between Washington Dulles and Amarillo, Texas – just over 1360 miles! 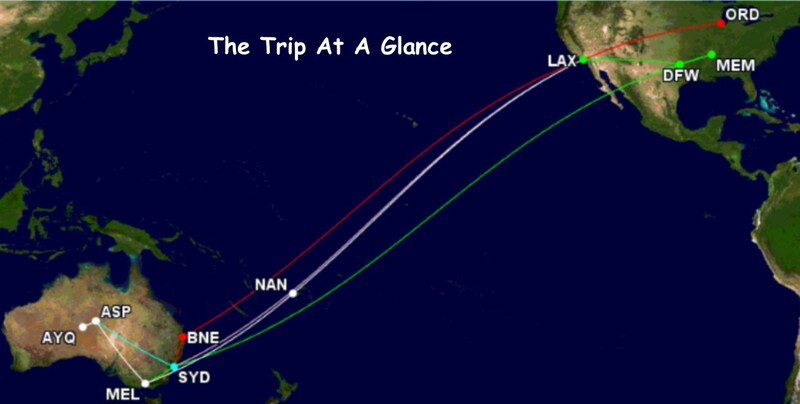 When doing our original trip planning, I was hoping to leave the US on a Friday or Saturday to minimize the amount of vacation time we’d take off but the availability of the DFW-SYD flight mid-week changed that plan. Now I’m glad it worked out that way because if we’d left the US on the weekend, we’d be flying to Uluru the following weekend and as I found out, Qantas doesn’t seem to release many (any?) award seats to Uluru on the weekends. We’d have been fine flying in economy but booking 11 months in advance the only award seats we found were in business class (equivalent to US domestic first class). Not only that but I only found two seats from Sydney and two from Melbourne. Fortunately there were plenty of SYD-MEL seats available. So my friends got to sleep in a bit while I got up for an early morning trip to Melbourne. We all met in Alice Springs at its cute little airport and took the last leg together. I did stop in the Qantas lounges in Sydney and Melbourne and had a bite to eat. They were quite busy so I didn’t take any photos. But both offered hot and cold foods and had quite a large selection. Since we were in business class we also had food on the plane so I didn’t have to worry about going hungry at all. On our flight back to Melbourne, there were only two business class seats available so one of my friends bit the bullet and paid cash for a ticket. Fortunately it wasn’t too expensive and for a relatively short flight she said it was fine. So that’s how we got around the country. Next up, our visit to the Red Centre! The day finally arrived when I was on my way for this much-anticipated South Pacific birthday vacation. Since I had booked the DFW-SYD flight on a separate ticket, I booked my MEM-DFW flight to arrive well in advance so that if something should go wrong and the flight should get canceled, there was still another MEM-DFW flight that would get me to Dallas in time to catch my flight to Sydney. That meant I got to Dallas mid-afternoon and the Sydney flight didn’t leave until after 9 PM, but I was fine with that. I have a friend who works near the DFW airport and we went out for a light dinner at the normal dinner time though I didn’t want to overeat knowing I’d have a full meal on board. Once I got back to the airport, I decided to visit the Qantas lounge in Terminal D. It’s actually one of several small contract lounges located on the second floor of the terminal. 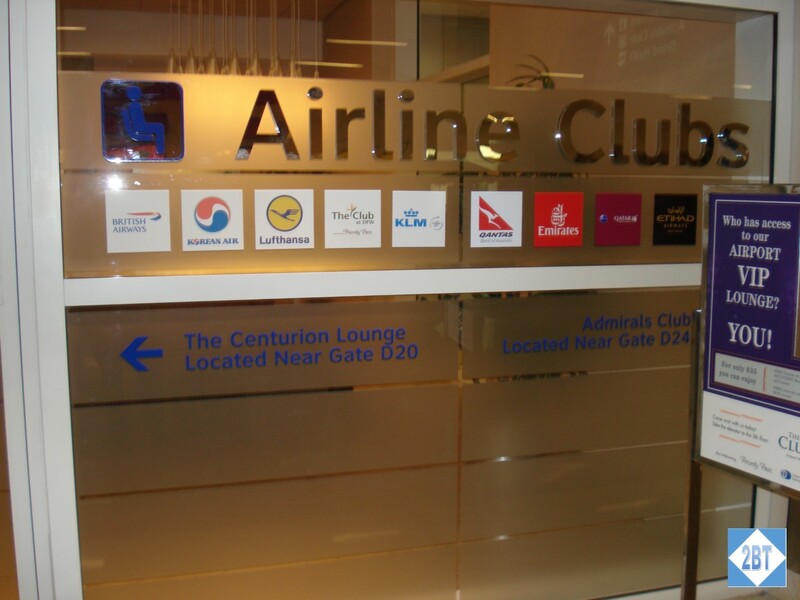 To reach the club, enter the generic airline clubs entrance and take the dedicated elevator to the second floor. There the folks at the desk will point you to the correct lounge. I have a couple of friends I like to travel with and over the years we’ve all had a birthday that ends in a zero (with different leading digits!). Our tradition has become whoever has the “zero birthday” gets to pick the vacation spot and we try to do it up right. About two years ago I first got into the miles and points game and it wasn’t long before I set a goal of celebrating my next “zero birthday” in Australia and using miles and points to pay for as much of it as possible. My dad, who’s a 2 million miler on American, offered to give me whatever AA points I needed to make my trip happen. That left me a goal of helping my friends accumulate the miles they’d need to fly Down Under too. Then, of course, there would be points needed for hotel rooms. Lofty goals but with two years to get things planned, we were able to accomplish it relatively cheaply – well, cheaply as compared to what it COULD have cost! I had visited Australia before, in 2006, and was eager to go back. One of my friends had been there as well but the other had not. So I knew that meant I’d need to re-visit some of the iconic places but I also wanted to be sure to visit some places I’d never been. My prior trip had involved stops in Sydney and Cairns, which is up near the Great Barrier Reef. While I would have loved to have gone back to the GBR, there were other places I wanted to visit as well, and with a total trip length of two weeks, we just couldn’t squeeze everything in this time around. In the end we flew from the US to Sydney and stayed there four days. 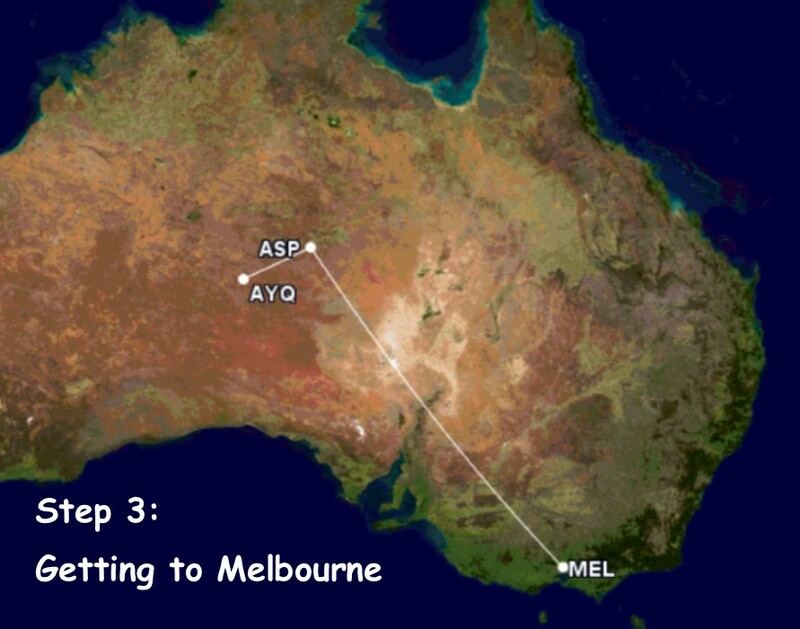 Next we flew to the Red Centre of the country and visited Uluru (Ayers Rock) for a couple of days. Then it was down south to Melbourne for a bit more than two days. During our trip planning we had talked about stopping off somewhere a little more exotic on the way back, somewhere we could just enjoy the beach, the sun and the surf. Since we’d be using primarily American Airlines miles, I quickly realized that due to their routing rules we’d need to stay in Oceania for our beach time. That led us to look at Fiji as our final stop before heading back to the US. All transfers are for a minimum of 1000 points and must be transferred in 1000-point increments. Recently Qantas was added as a transfer partner, making Citi the first US card issuer to allow direct transfers to Qantas Frequent Flyer (QFF). Several bloggers have pointed out that it’s not particularly a great deal given that Qantas awards are distance-based and international flights will incur fuel surcharges. What this transferability does offer is flexibility. Qantas is part of the oneworld alliance along with American Airlines, British Airways and others. Qantas (and BA) open their booking schedules approximately three weeks before American opens theirs. This, combined with how few premium cabin seats Qantas makes available, mean that award seats can be booked using QFF (or BA Avios) as soon as they’re released – leaving those with only AA miles to pick up the crumbs that are left. The downside is that Qantas charges 168K QFF miles and BA charges 150K Avios each way in first class from North America to/from Australia. And both programs incur fuel surcharges of $390 each way to go along with the taxes and fees. Short-haul flights using QFF miles are cheaper than the US legacy carriers at 8000 miles each way for flights of up to 600 miles but BA only charges 4500 Avios each way. So would you ever want to transfer your Thank You Points to Qantas? Probably not, but it depends on your situation. If you’ve been saving up TYPs for a trip Down Under this will get you in the door more quickly though you’ll still have to shell out over $400 for first class flight. But it may be worth it to you to lock in a first class flight well in advance. Once the American Airlines calendar opens up, you could cancel your ticket bought with QFF miles and watch for the seat to go back into award inventory and then use your AA miles to pay for it. The question is: is the reward worth the risk of losing your first class seat? For me, the answer is no. I’d rather pay the $400 and lock in my flight than risk losing it. Since a first class ticket goes for $9600-$10,300 (depending on whether you depart from Los Angeles or Dallas) each way, it’s absolutely worth it to me to lock it in and not worry about the $400 – but as always, it’s your call.